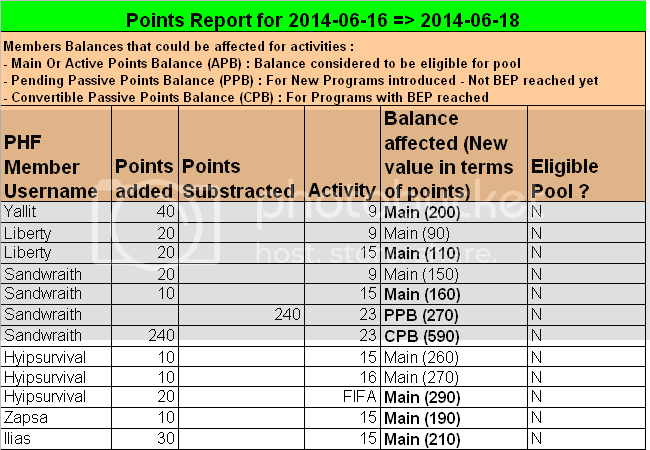 Find here all the details about points which were added or substracted to active PHF members starting from June 1st until June 30th. Thanks for those who "dared" introducing new programs. I will soon create the special account which will have to be used only for introducing programs without knowing the introducer. Note that it will be possible to introduce unconfirmed programs with this special account like other named accounts - No excuses to test the opinions of other members! Don't hesitate to relax you on our special World Cup topic animated by hyipsurvival - looks like this world cup will let us many surprises! Hyipsurvival keeps first rank. Zapsa reached second rank with a difference of 20 points with Ilias. 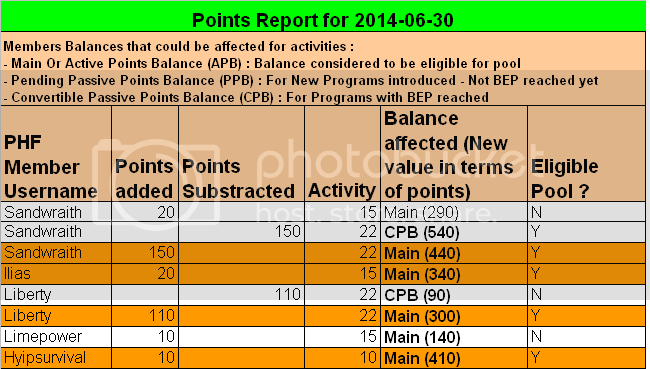 Some members have a good amount of points in their CPB balance, which can lead for some of them to be eligible for money pool if they ask for CPB conversion into main points. 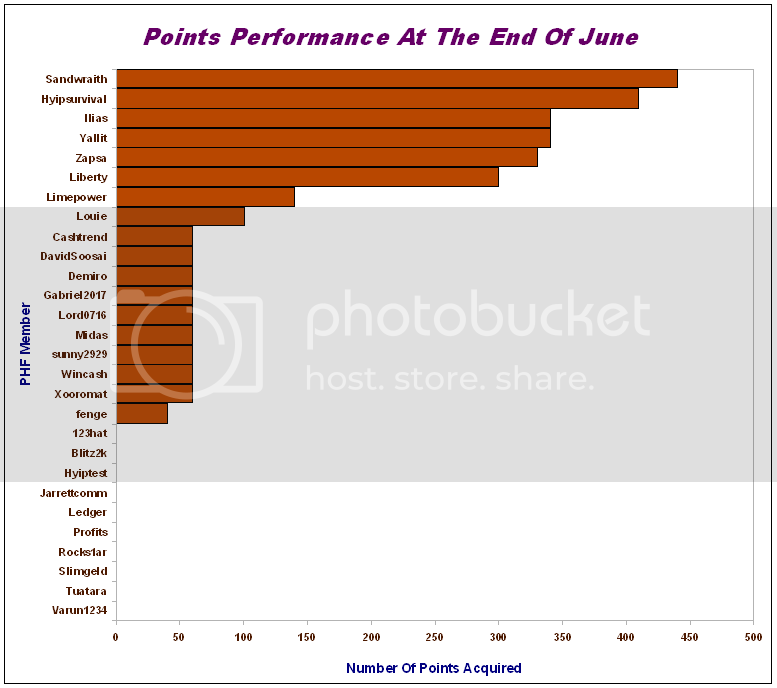 I wish you a nice week and good profit with PrivateHYIPForum even if the summer season is hard for hyips investing. Hyipsurvival keeps first rank at the end of this week. It's refreshing to read his comments on World Cup particularly with the flow of fast scams we face currently in our industry. 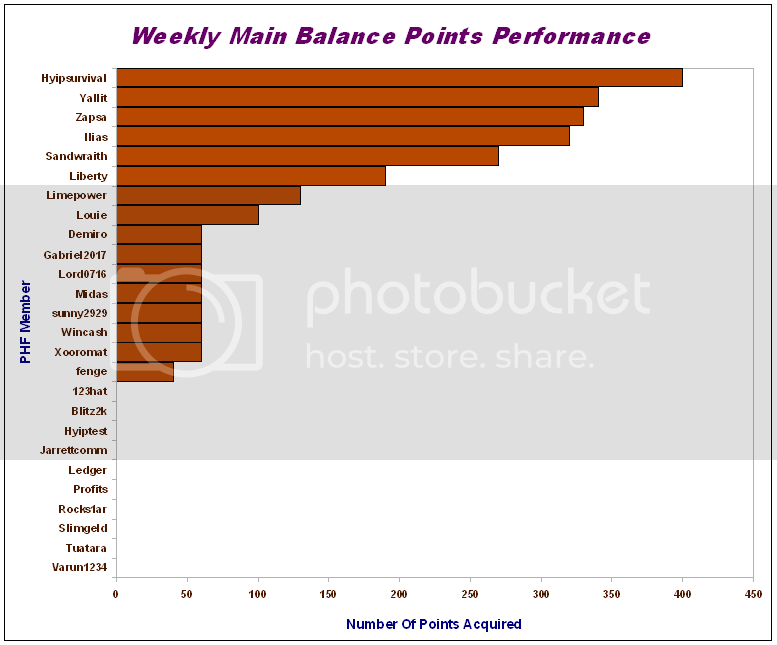 Yallit, by converting some of his CPB points into main points, reached so far the 2nd rank. As you can see, having a reserve of CPB points can be useful for different situations like vacations, unplanned events and so on while having still the possibility to get a part of our money pool. To get some CPB points, search for some good new programs which can be profitable to our community and share them with us! Zapsa, our recent member in our community, is still among our first three members and so a chance to become our future sponsor! 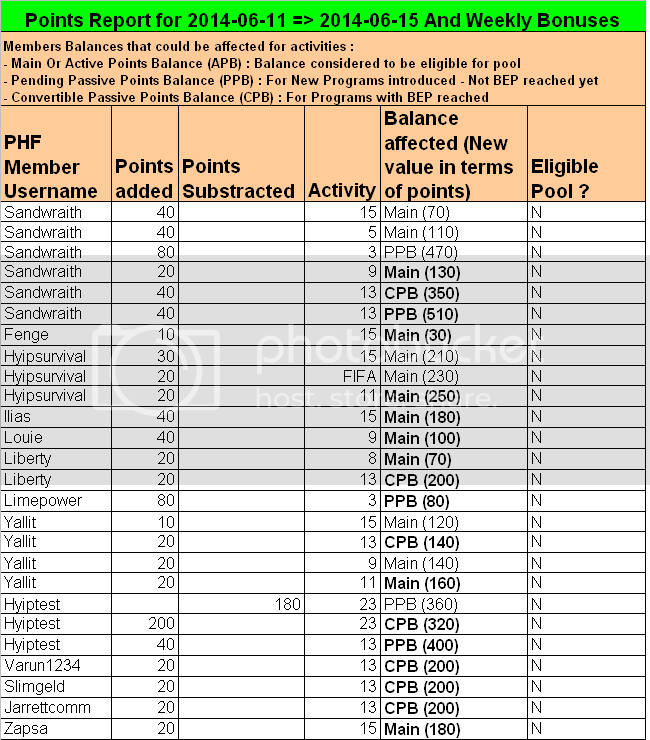 This shows clearly that with some regular committment, it's not so hard currently to be eligible for money pool and get a good rank in our community. I'm glad to see some members introducing more programs in unconfirmed status. That means that other members are encouraged to give their opinions at least to help the introducer to decide to confirm or not the program. As long as program is not confirmed, there are no penalities. If a member joins an unconfirmed program and this latter scams, I don't want to see any complaint, you took the risk without waiting that the program to be confirmed. 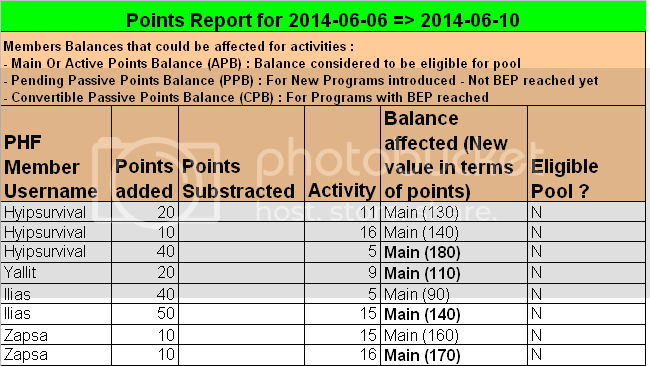 Points starts to be evaluated AFTER confirmation of program AND then rules are applied in case of fast scam program. Spend a nice week with PHF! For June, we have 6 eligible members for money pool and 4 of them will be our July forum sponsors. 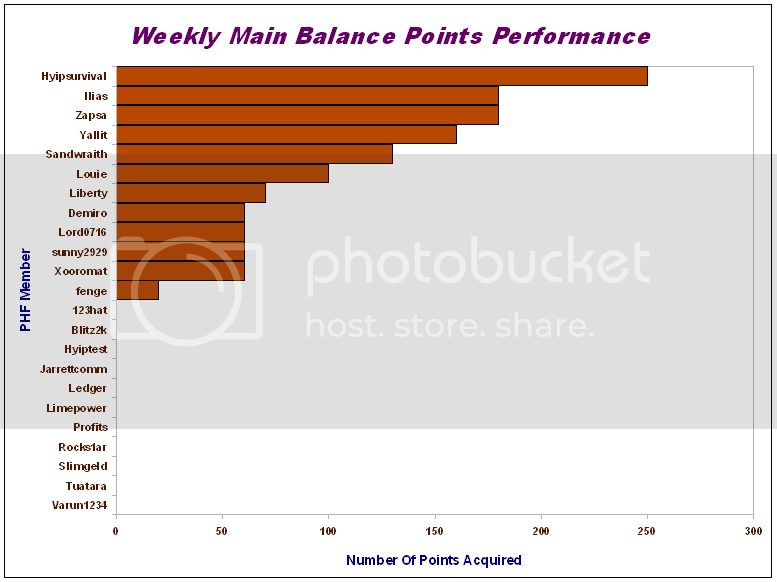 Indeed, two members have same number of points : Ilias & Yallit. They both deserve their place so I decided we will have 4 forum sponsors instead of the usual 3 ones. Sandwraith is our first best active member for this month - Recently a new Gold Member, he clearly brings a good amount of profitable picks in our community and I appreciate when he shares advices! Hyipsurvival is our second best active member for this month - Always helping our new members and animating the best thread for World Cup! Zapsa is getting his first payout so I'm waiting for a password to be sent by private message in order to accept payment request. 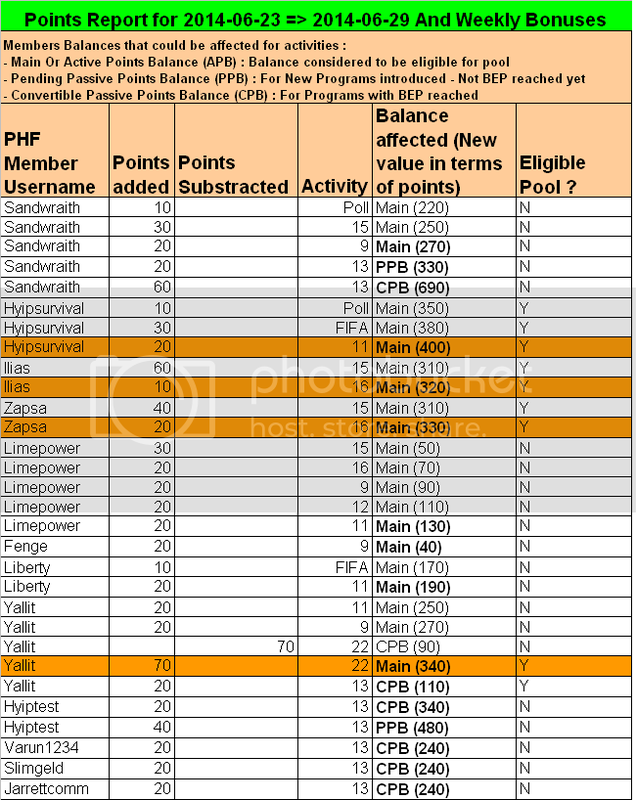 I invite Zapsa to read the part of forum rules about the process how to claim a payout. 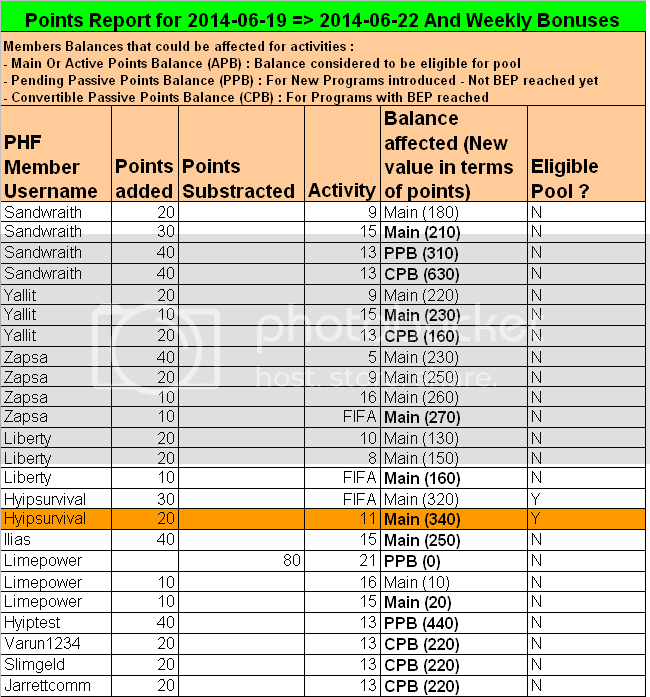 The next chart is only for members eligible for PHP - You will see how much you have earned. 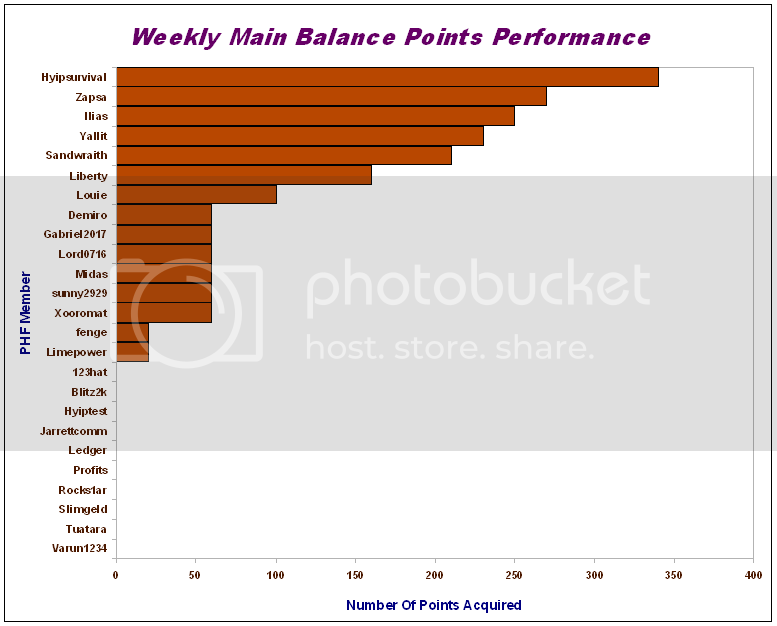 As a reminder, you will get paid a fixed amount + variable amount which depends on your points rank.